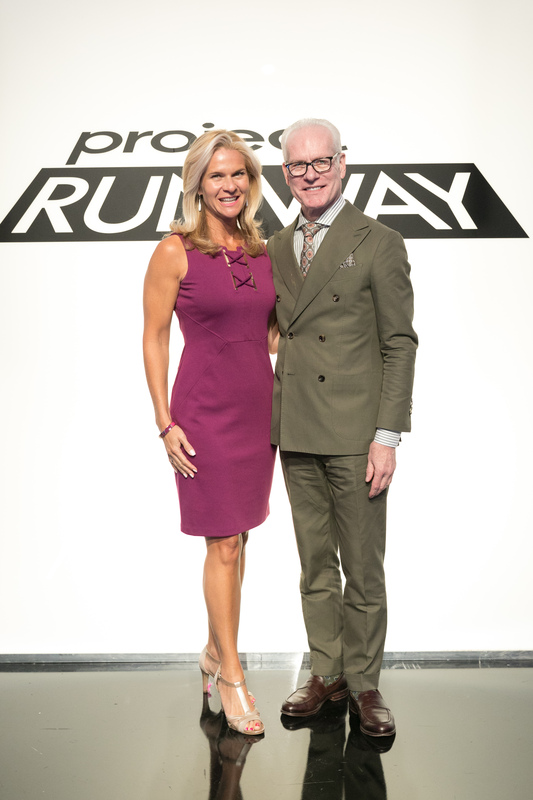 Tim Gunn: The Classiest of Class Acts! When I signed up for my first Avon 39 Walk to End Breast Cancer back in 2014, I had no idea it would lead to meeting one of my favorite TV personalities and fashion gurus. 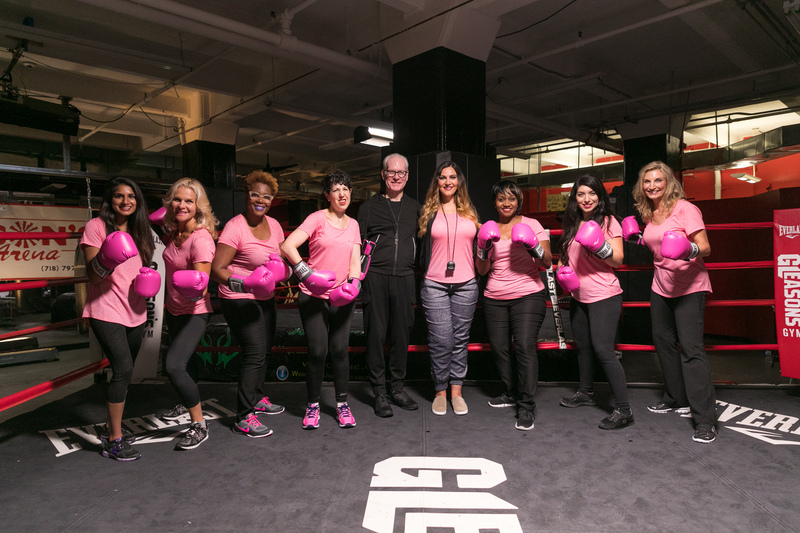 If you tuned in to last week’s episode of Project Runway, you may have caught a glimpse of me and some amazing women sporting pink boxing gloves flanking Tim Gunn in the ring at Gleason’s gym in Brooklyn. I was honored to be selected to be a part of this group assembled to serve as inspiration in the “Avon Warrior Challenge.” The remaining contestants -and viewers around the country, listened to Avon’s Executive Director of Sales Development Evy DeAngelis (there’s a chance we could be distant cousins!) describe the company’s mission of improving the lives of women globally and its long history of fighting breast cancer through the Avon Breast Cancer Crusade. Next, we heard from fierce survivors Michelle Ward and Tawana Lyles as they each described their personal battle with breast cancer. The forever-gracious Tim then instructed the designers to use this information as inspiration to create designs showcasing the warrior spirit. As a producer who knows all too well how much footage ends up on the cutting room floor, I thought I’d give a few more details about Avon’s background in the fight against breast cancer. Since 1992, the Breast Cancer Crusade has donated more than $800 million to breast cancer causes, educated millions and has funded breast health screenings for nearly 20 million women. Some of the funds are raised through Avon 39 Walks around the country. As my repeat readers know, I’ve made some incredible memories on four Avon walks to date and I don’t plan on stopping until we wipe out this disease once and for all. Click here to learn more about the Crusade and to learn more about Michelle, Tawana and the other “warriors” featured in this special episode – Anita Shivraj, Linda Montavon, Ivanna Diaz-Hansen and Donna Reid-Mitchell. 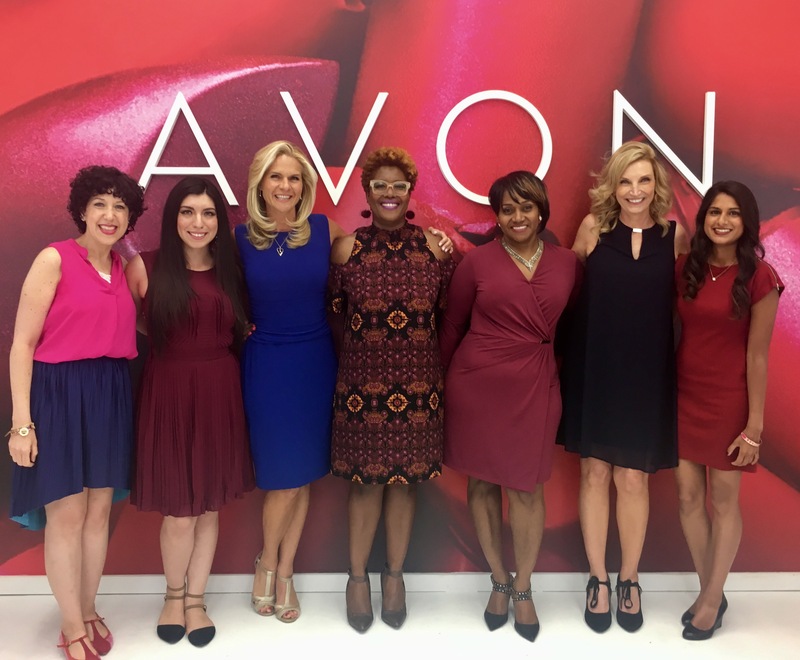 I close this Motivation Monday post with a thank you to Avon for asking me to be a part of this once-in-a-lifetime experience and for giving me the opportunity to meet an amazing group of fierce, fabulous women who I am lucky to call new, lifelong friends. I also want to thank everyone who shared in my excitement leading up to the show; those who took the time to send an email, text or leave a kind comment on my social media pages afterward and to the special group of friends who watched the episode with me. I am already looking forward to my next Avon Walk in 2018…and here’s to the unexpected adventures ahead of all of us as we continue on this journey to have fun, be fit and feel fabulous! Six years ago, this Motivation Monday fell on July 13th. That day marked the very first installment of LauraLovesFitness. As my blog turns another page into a new year this week, I am simply overwhelmed by the passage of time. Pick a topic ranging from the political climate; global warming; the roller-coaster ride that is forever Wall Street or the revolving door of celebrity relationships, and it’s obvious we’ve witnessed so many changes in the country and throughout the world since that first post back in 2011. Closer to the home front, I have found this to be a significantly big year when it comes to upheavals and surprises. While I continue my career in production both on-camera and behind the scenes and maintain my fitness certifications, there were so many changes within my family and circle of friends. At this time last year, my parents moved out of my childhood home. While that move turned into the biggest production of my life, today I can happily report Mom and Dad seem content with their new routine at a new address. Since last July, I’ve also laced up for not one, but two more Avon 39 Walks – one here in New York City and another in Boston. Sadly, not even a month after conquering the 39.3-mile journey in New York City journey, we said good-bye to our dear friend Liz after her three-year battle with breast cancer. There have been other sad good byes, but there have also been celebrations of new beginnings thanks to a few weddings and a few new bundles of joy arriving in our world. I realize life is a journey filled with road bumps and unexpected turns, but with each year that passes the highs and lows seem to make a more powerful impact on my heart and soul. I also know I’ve managed the ups and downs of another year thanks to my faith; an amazing network of people I am blessed to call friends and family and that daily surge of endorphins I get through exercise. It’s amazing how a good sweat helps bring me back to center even when I feel like life is more than I can handle. Then there are the weekly installments here at LauraLovesFitness. In this chaotic world, I find some sense of clarity when I can get my thoughts out “on paper.” It’s cathartic to share my successes and failures on the never-ending quest for well-being. Kicking off 43 with a Bang…& a Kick! 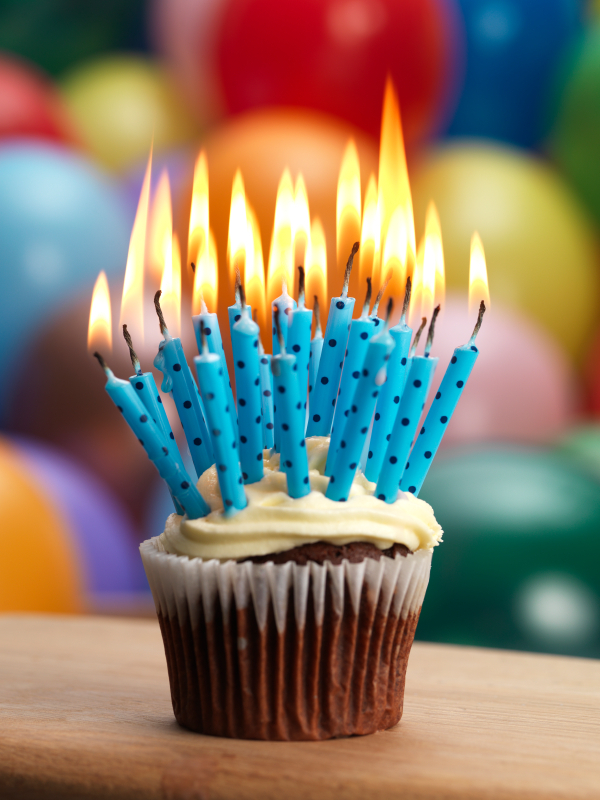 I close this blog birthday post like all the ones before: I offer a heartfelt thank you to all my readers who inspire me to keep writing and keep moving! Whether you’ve been following my blog since day one or just last week; if you’ve taken the time to share, like, or comment on any of posts on my other social media channels – each act of support goes a long way! If there’s anything you want to read more or less about here, I’m always looking for suggestions on ways to take LauraLovesFitness through another year. Here’s to what comes next not only for my blog, but for the adventures that await on our continuing journey to have fun, be fit and feel fabulous!